The SP may need to move tenant data to another cloud repository, for example, if the initial cloud repository is running out of space. Scenario 1: replacing the cloud repository. The SP may want to replace the initial cloud repository with a new cloud repository, for example, with a cloud repository that has more storage capacity. This scenario does not require any actions on tenant's side. Scenario 2: adding a new cloud repository. The SP may want to configure a new cloud repository in addition to the initial cloud repository and move tenant data to it. This scenario requires addition actions on tenant's side. The procedure of moving tenant data to another cloud repository is intended only for regular backup repositories exposed as cloud repositories. You cannot use this procedure to move tenant backups to a cloud repository that has a scale-out backup repository as a back end. 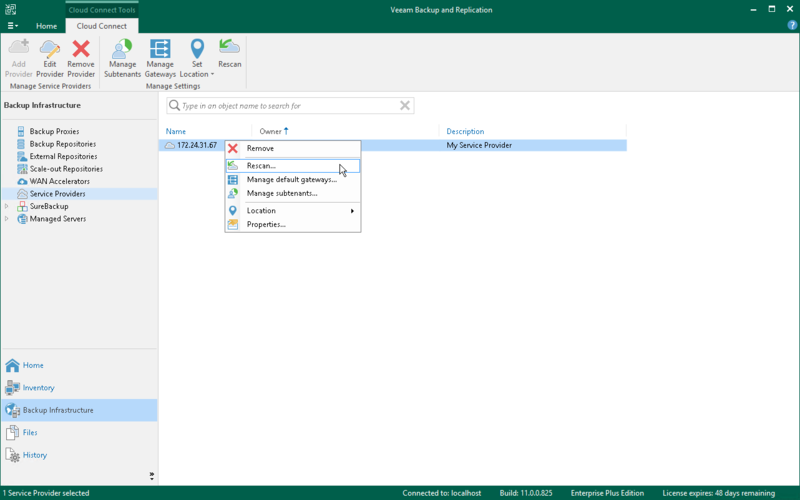 If you need to move tenant data to such repository, please submit a support ticket at www.veeam.com/support.html. Configure a new backup repository that you plan to use as a cloud repository. Open the Cloud Connect view. In the inventory pane, click Tenants. In the working area, right-click the tenant account and select Disable. 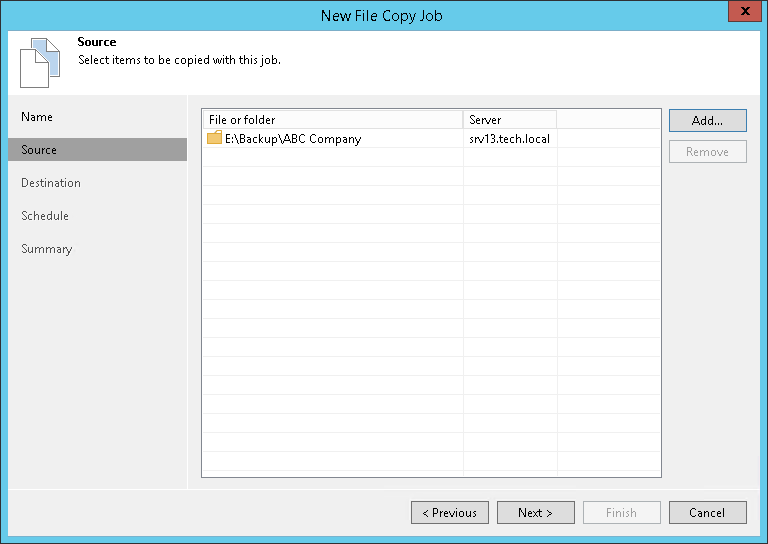 Copy a folder with tenant backup files from the initial cloud repository to the new cloud repository. In the working area, right-click the tenant account and select Properties. At the Backup Resources step of the wizard, select the initial cloud repository in the list and click Edit. In the Edit Quota window, change the underlying backup repository for the initial cloud repository: from the Backup repository list, select the newly configured backup repository. If necessary, you can increase or decrease the tenant quota. If you have changed the tenant quota, the new quota will be visible to the tenant after the tenant performs a rescan operation for the service provider or cloud repository on his/her backup server, or after the next job run. 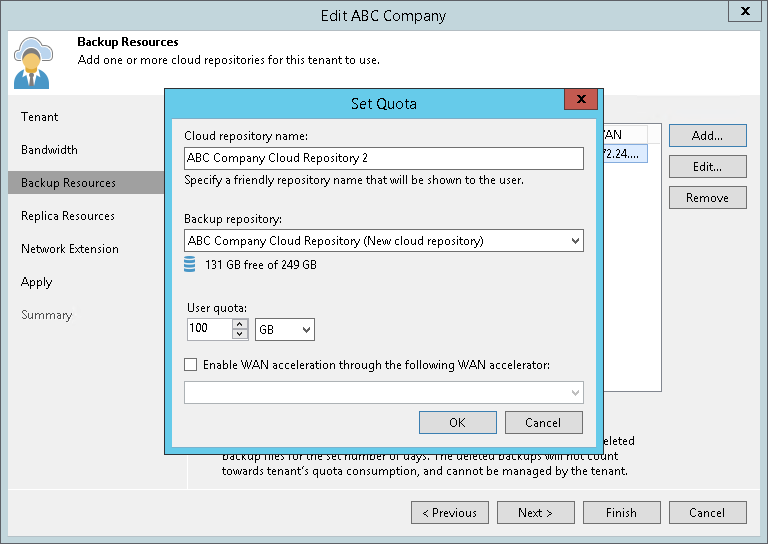 At the Backup Resources step of the wizard, click Add and allocate resources on the new cloud repository to the tenant. 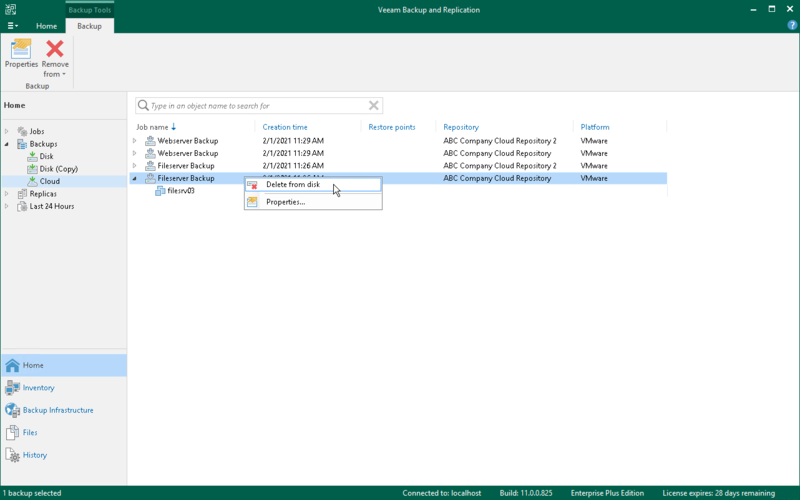 In the SP Veeam Backup & Replication console, open the Backup Infrastructure view. 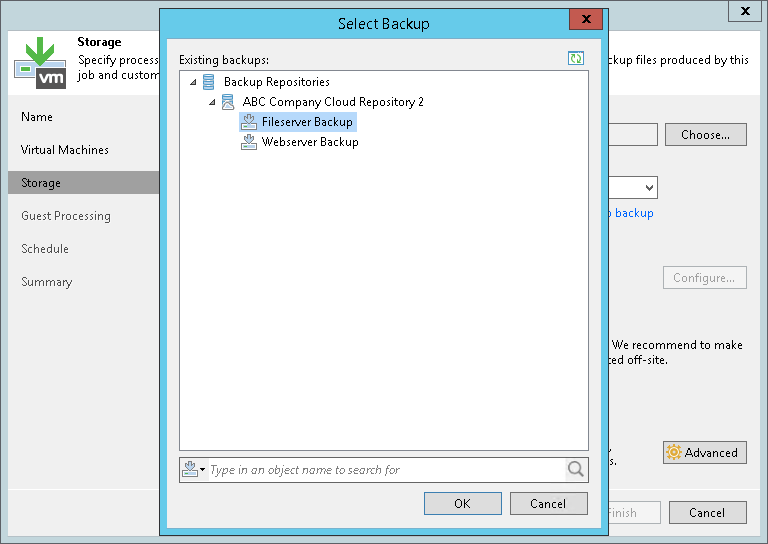 In the inventory pane, click Backup Repositories. 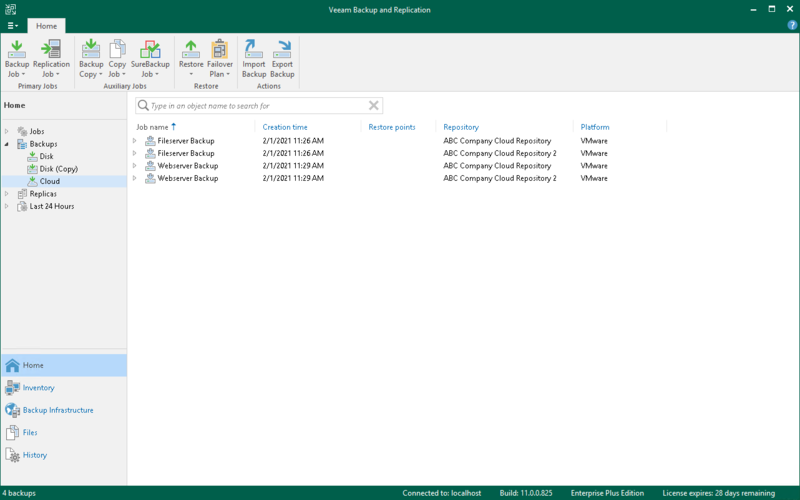 In the working area, right-click the backup repository that is exposed as a new cloud repository and select Rescan. Do not delete backup files on the initial cloud repository at this moment. It is strongly recommended that you delete backup files after the tenant completes the data migration procedure on his/her backup server and ensures no data is lost. 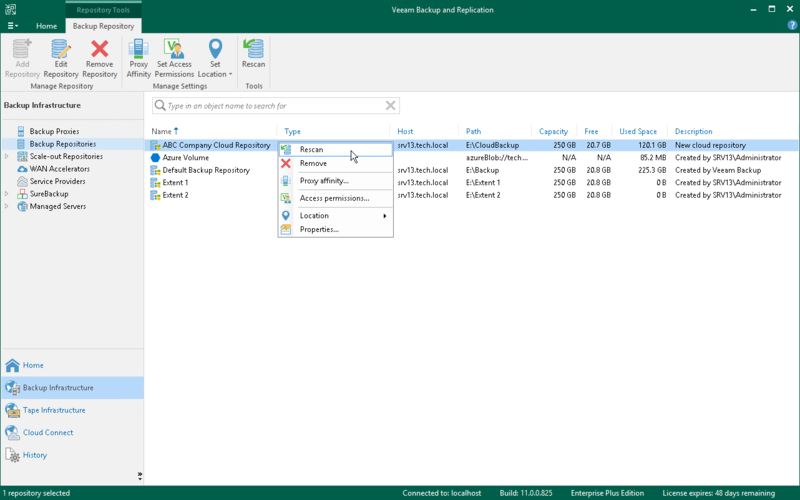 In the tenant Veeam Backup & Replication console, open the Backup Infrastructure view. In the inventory pane, click Service Providers. In the working area, right-click the service provider and select Rescan. In the working area, right-click the new cloud repository and select Rescan. Enumerate backups on the new cloud repository. Backups that reside on the new cloud repository will appear in the Home view next to backups that were created on the initial cloud repository. Select the Backups > Cloud (Encrypted) node, right-click the backup in the working area and select Specify password. In the Specify Password window, type in the password for the backup. Unlocked backups will be moved under the Cloud node. In the inventory pane, click Jobs. In the working area, right-click the job that you want to edit and select Edit. At the Storage (for backup jobs) or Target (for backup copy) step of the wizard, select the new cloud repository from the Backup repository list. In the Select Backup window, choose the backup job and click OK.
Repeat steps c-g for all jobs that whose backups have been moved. In the inventory pane, click Backups > Cloud. In the working area, right-click the backup job whose backups you want to remove and select Delete from disk. Repeat steps b-c for all jobs whose backups whose backups have been moved. Make sure that you do not delete backup files from the new cloud repository instead of the initial cloud repository.